Superior Carpet and Upholstery Care also offers the finest area rug care in Des Moines, IA and the surrounding areas: Altoona, Ankeny, Clive, Johnston, Pleasant Hill, Urbandale, Waukee, West Des Moines and Windsor Heights. Area rugs complete a room's look by adding warmth, color and texture to a space. Protect your investment with area rug cleaning. 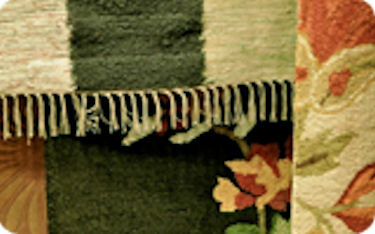 Area rugs come in two different fiber types, synthetic and natural. Synthetic includes for example: nylon, polyester, olephin and polyproplene. Natural includes wool, cotton, and jute for example. Synthetics can be maintained and cleaned in your home. Naturals are cared for in another way. This requires us to pick up the rugs and in-plant clean them at our location. Once completed they are returned to your home. No matter what style or fabric your rug consists of we have the knowledge to clean and maintain your piece for years of beauty and use! Please check out our Carpet Cleaning, Water Damage Restoration, Upholstery Cleaning, Carpet Repair and Stretching and Tile and Grout Cleaning services as well!